My brother called the other day to say he was stopping for dinner with some colleagues and they were bringing fresh Salmon and Halibut - caught just 48 hours earlier in Alaska! Oh yum! There is nothing better than fresh caught fish (even if it was flash frozen two days ago). When you're land locked - that's as fresh as it gets. I needed to throw some side dishes together quickly. This bean salad is a nice quick option (if you have the barley already made) and I can imagine it with more than just fish. It's hearty enough to stand up to a grilled burger or steak even! Get fresh green beans from the farmers market for the best taste. The mustard in the dressing and tart apples are a fun mix. You can cook the barley the day before to save time putting it all together or simply mix the whole salad together and let the flavors do their thing. The flavors meld quite nicely overnight as I found this salad extra tasty as left overs. This is one of those salads that I think grows on you, or at least it did with me. I just thought it kept tasting better the more I ate it. Fabulous fish, great company and a bean apple salad. 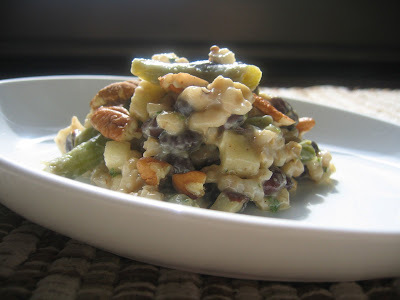 It's a healthy, high fiber salad that will make you fat and happy! Cook according to directions; cool. handful of walnuts- I prefer them toasted, but it's not necessary. (adjust according to taste - you may like a more lemony taste so add more lemon. Use your favorite mustard- I used a grainy mustard). I'm not big on salt either, so you may want to add a little salt. Pour the dressing half the dressing onto the salad and toss. If needed, add the rest of the dressing and top with fresh chopped parsley.